What Exactly is Yankton's Meridian District? In a nutshell, The Meridian District is Yankton's beautiful, historic downtown. You will find tons of history, unique shopping experiences, professional business services, entertainment, dining, downtown living, recreation and the iconic Meridian Walking Bridge. The district encompassed Linn Street to Burleigh Street and 5th Street to the Missouri River. 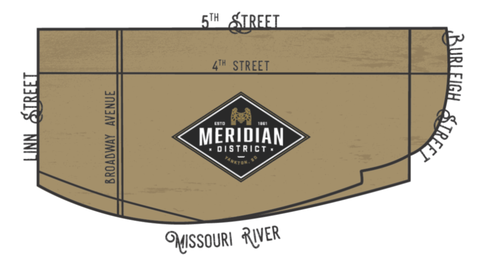 Come to the Meridian District to experience events throughout the year. These include Market at the Meridian, Thursday evening Music at the Meridian, 3rd on 3rd Block Party, 4th of July Fireworks, Rock n Rumble, Crazy Days, Riverboat Days & Summer Arts Festival, Harvest Halloween, Black Friday, Small Business Saturday and the Holiday Festival of Lights. Come on down to the Meridian District and see what we all have to offer!